BREAK OUT THE FANCY HATS AND SUN DRESSES BECAUSE THE PHILADERBY IS BACK!! 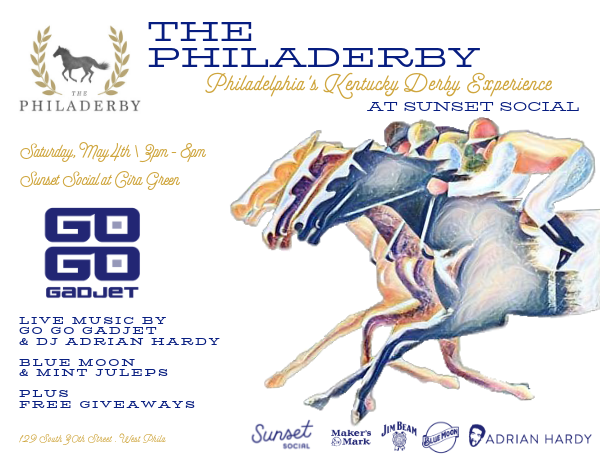 Philadelphia's Premier Kentucky Derby Experience - Enjoy all aspects of Louisville's high society racing spectacle without leaving the heart of Philadelphia. The Philaderby is Presented By Blue Moon. This year at our NEW VENUE, thousands will gather, dressed to impress, at Center City's best outdoor venue to party and support a great cause. Dance the day away with live music from Go Go Gadjet and DJ Adrian Hardy! Attendees can participate in outdoor games and strut their stuff for "Best Dressed” prizes - all culminating in the 144th renewal of The Greatest Two Minutes in Sports being broadcast live on Sunset Social's 50 FOOT jumbotron TV screen. 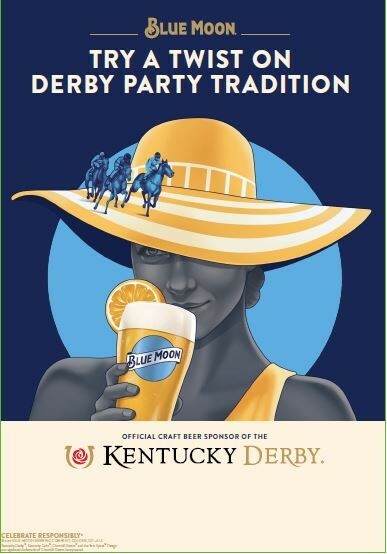 Featuring a special 'Derby Drink List' which includes Blue Moon, Jim Beam, and other derby favorites. This is going to be the premier day party of the spring- you won't want to miss out! -1 Raffle ticket to win amazing prices! DJ Adrian Hardy - In high demand on the U.S. dance scene, Adrian has obtained residencies at some of the most noted party venues in the country. Through high profile gigs such as Miami’s Ultra Music Festival Adrian is solidifying his reputation as a high-energy nightclub DJ, as evidenced by his 20,000+ followers on social. You can find him actively traveling & playing throughout Philadelphia, New York City, Las Vegas, DC, Atlantic City, and across the country. Wherever there’s a rocking party, you can be sure to find DJ Adrian Hardy. "Fancy Hat" for the ladies - The bar was set VERY high last year! "Best Dressed" for the men - Let's go guys, don't disappoint the ladies. "Snazziest couple/group" - Coordination is key! The Official Philaderby After Party will be hosted at The Post. We'll put you on our guest list so you won't have to wait in line or pay a cover! See you there! View More Events Organized by Philaderby. This event is organized by Philaderby.